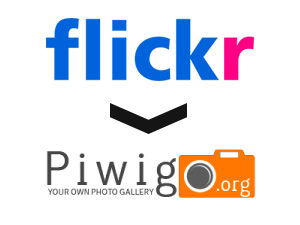 User Guide: Plugin Flickr2Piwigo lets you import your albums (sets) and photos from Flickr, directly into your Piwigo gallery. Here is the procedure to follow. Update some languages and some minor style fixes. * Fix error with some photos not in any Flickr photoset (album). * Better error message when the cache directory isn't writable. * Updated Piwigo version compatibility (no longer support Piwigo less than 2.8). * New option to import a 'Moderate' or 'Restricted' safety keyword. * Fix bug with importing photo visibility. * Fix the import-all-photos function so that it can import any number of photos. * Error reporting (including logging) is improved. * Coding standards updated, including continuous integration. * Fix error with caching login test that was displaying the login button again after being redirected back to Piwigo. * Update documentation on the config tab, because we no longer need to set the callback URL. Switch to Curl client for OAuth. * Add support for OAuth authentication.